Born to American parents in Mexico City in 1933, Thornton graduated from Princeton in 1955. While focused on Mechanical Engineering, Thornton was also studying painting under William Seitz, who would soon after become a curator at the Museum of Modern Art. Though he began by creating figurative cartoons for The Daily Princetonian and The Princeton Tiger, Thornton had immersed himself in the Abstract-Expressionism movement, as had many artists done during this time. It wasn’t until the 1960’s that John would begin to shape his artistic capabilities into his own, unique style. Though his approach to art became more in touch with minimalism, his voice as an artist continued to grow – Thornton explained his work as “searching for the meaning of line as an edge or a direction that attempts to describe a spatial event”. According to Roger Mandle, former Director of the National Gallery of Art in Washington D.C. – the paintings during the 1960’s are “his intuitive exercises in which lines paradoxically ‘undefine space’ through his exquisitely lean color palette and simplified forms. Against neutral colored backgrounds, Thornton often paints outlines of archetypal domestic shaped: shoes, trees, towers, and other suggesting forms that demand space for their presence. By the use of subtle transitions of color within these lines, he flattens the forms to abstractions that become cyphers for themselves. Thus, the lines defy space and form so that we must confront his paintings as abstract exercises of great beauty and pleasure.” John would go on to work as an Associate Professor of Art at the Massachusetts College of Art in Boston between 1963-84. 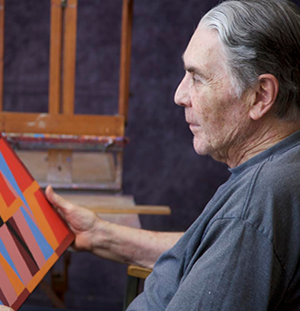 His career as an artist spans more than 50 years and truly reflects an artist’s lifelong dedication to pictorial expression.